The average hospital cost of a burn injury can range anywhere from $50,000 to $200,000, depending on the severity of the injuries involved. Additionally, serious burn injuries often require skin grafts, reconstructive surgery, and a period of physical therapy. The financial impact of a burn injury can be quite substantial, not to mention the pain and suffering involved. At the law office of The Orlow Firm, our attorneys work closely with medical economists and life care planners in determining the financial impact of a burn injury. If you’ve been seriously burned in a fire or have a loved one with severe burns, contact our NYC burn injury lawyers today for a free consultation. Retailers, hotels, or apartment managers are liable for burn injuries and deaths that occur due to locked fire exits or building code violations involved in a fire. Sprinkler systems that don’t work, lack of smoke detectors, or an absence of clearly marked fire exits may create additional liability for property owners when it’s clear these dangers were ignored. Similarly, manufacturers can be held liable when there’s clear evidence that a smoke detector failed to work or a sprinkler system malfunctioned. Working with fire investigators and other experts, our attorneys determine what caused a fire or explosion in order to hold those responsible accountable for our client’s burn injuries. Construction sites in New York City often put workers at risk of burns. Equipment can explode. Electrical wiring can be exposed and dangerous. One small error by another worker or a negligently maintained piece of equipment can result in serious injuries or deaths. The Orlow Firm has attorneys who can help you obtain the compensation you need after a construction accident causes burn injuries. We offer aggressive, caring and diligent assistance. Our three-lawyer team, together with our paralegals, investigators and experts, is highly experienced in investigating construction accidents and has built a reputation for providing attentive client service and knowledgeable representation. Our NYC burn attorneys focus much of our law practice on construction site accidents, including burns and other injuries resulting from electric shocks and explosions. To contact us for a no-charge consultation, call (646) 647-3398 or contact us online. Burn injuries from a welding accident? Electrocution from faulty wiring, defective power tools, contact between ladders and wiring and power lines or contact between live wires and saw blades or another power tool? An explosion from a car, truck, forklift, crane, dump truck or other vehicle? An exploding propane tank or other flammable material, fuel or gas? 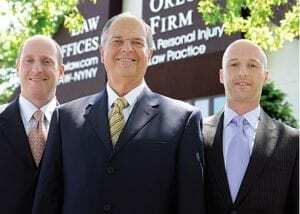 If so, The Orlow Firm may be able to help you. We will thoroughly investigate your case to determine whether you can file claims against negligent third parties. These are people or entities other than your employer or co-workers whose negligence contributed to your accident. Third-party negligence claims can result in higher damage awards than workers’ compensation. It’s important to begin an investigation into a fire, explosion, or chemical spill as soon as possible after an accident. Not only is it important for collecting physical evidence, but also for collecting eyewitness testimony before people forget important details surrounding an accident. To schedule a free consultation to discuss your case and injuries, contact NYC burn injury attorneys at the law office of The Orlow Firm online or call (646) 647-3398.